THIS IS OEM FOUR WINNS MARINE GRADE BOAT STRIPING. (GREEN SILVER ) IT IS PERFECT FOR REPAIRING OR UPDATING THAT OLDER BOAT. LENGTHS, BUT MORE IF AVAILABLE IS YOU NEED IT. Sold as seen in pictures. We're your port for thousands of hard to find boat parts, original manufacturer's parts and marine surplus. Check out this deal! Don't live in the US or Canada?No need to feel left out. THIS IS OEM FOUR WINNS MARINE GRADE BOAT STRIPING. IT IS PERFECT FOR REPAIRING OR UPDATING THAT OLDER BOAT. LENGTHS, BUT MORE IF AVAILABLE IS YOU NEED IT. THIS IS OEM FOUR WINNS PURPLE/SILVER/WHITE MARINE GRADE BOAT STRIPING. IT IS PERFECT FOR REPAIRING OR UPDATING THAT OLDER BOAT. LENGTHS, BUT MORE IF AVAILABLE IS YOU NEED IT. THIS IS NEW MARINE GRADE BOAT STRIPING. 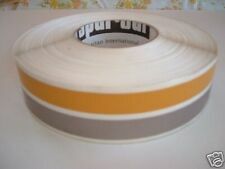 IT IS A FOUR WINNS HULL TAPE, THE COLOR IS YELLOW AND SILVERISH/GOLD. PERFECT FOR REPAIRS OR UPDATING THAT OLDER BOAT. THANX FOR LOOKING. Boat part number 1078045 is a new roll of decal pinstripe for a Rinker Boat, part number 218764, may be used on other boats. Part Number: 218764. Boat Manufacturer: Rinker Boats. This pinstripe tape is constructed out of navy / silver marine grade vinyl with an adhesive backing for installation. THIS IS OEM FOUR WINNS MARINE GRADE BOAT STRIPING. PART NUMBER 0572708. IT IS PERFECT FOR REPAIRING OR UPDATING THAT OLDER BOAT. LENGTHS, BUT MORE IF AVAILABLE IS YOU NEED IT. Boat part number 8701548 is a new roll of butted deck pinstripe decal from Sharpline, part number 149128-04. Commonly used on Marquis Yachts, part number 8154106. May be used on other boats. Part Number: 8154106. Boat part number 7500689 is a new main hull pinstripe tape roll for a 2013 G3 Boat, part number 73405013. Part manufactured by Sharpline, may be used on other boats. Part Number: 73405013. This main hull pinstripe roll is constructed out of gold / black marine grade vinyl with an adhesive backing for installation. It has 4 grey stripe that are each roughly 1 1/2" the blank space between each one is 1/8". OEM BLACK WHITE FOUR WINNS HULL TAPE PINSTRIPE MARINE GRADE BOAT RV DECAL 1/2"
THIS IS OEM FOUR WINNS MARINE GRADE BOAT STRIPING. IT IS PERFECT FOR REPAIRING OR UPDATING THAT OLDER BOAT. LENGTHS, BUT MORE IF AVAILABLE IF YOU NEED IT. THIS IS NEW MARINE GRADE 1 1/8" SILVER BOAT STRIPING. IT IS PERFECT FOR REPAIRING OR UPDATING THAT OLDER BOAT. LENGTHS, BUT MORE IF AVAILABLE IS YOU NEED IT. Boat part number 7300121 is a new pinstripe graphic decal tape from Sharpline, part number 4485-20. Commonly used on Thunderjet Boats, may be used on other boats. Part Manufacturer: Sharpline. Simply peel off and apply to any dry, clean surface. (JS / LOC: U3 C / 9035542). Colors are separate when peeled off and include: frost green (3/8"), space (3/8"), silver taupe (1/4"), space (1/8"), white (1/2"), space (1/8"), frost green (9/16"), space (1/8"), white (1/2"), space (1/8"), silver taupe (1/4"), space (3/8") and frost green (3/8"). Boat part number 7500693 is a new pinstripe for G3 Boats, part number 73404625. Part Number: 73404625. This pinstripe is constructed out of black, gray, and clear colored marine grade vinyl with an adhesive backing for installation. Part Number: 166039. Constructed of marine grade vinyl this pinstripe tape features a red color and a self adhesive back. Simply peel off and apply to any dry, clean surface. We're your port for thousands of hard to find boat parts, original manufacturer's parts and marine surplus. Boat part number 1075895 is a new pinstripe decal, part manufacturer unavailable, part number RIN0017899. Part Number: RIN0017899. This decal is constructed from solid white vinyl with a matte finish and adhesive backing. Part#: 37683. Between each of the three stripes is a 1 1/4" "blank" area. You can use any or all of the three stripes if desired. The pinstripe is one big piece, not separated. We're your port for thousands of hard to find boat parts, original manufacturer's parts and marine surplus. Boat part number 1075883 is a new roll of custom pinstripe tape, part manufacturer unavailable, part number 2190097. Part Number: 2190097. This pinstripe is constructed out of silver colored marine grade vinyl with an adhesive backing. Boat part number 1033385 is a NEW 150 ft x 1 3/8" roll of Larson / Glastron pinstripe, mfg. part # 05727141. We're your port for thousands of hard to find boat parts, original manufacturer's parts and marine surplus. Boat part number 1078043 is a new roll of pinstripe for Rinker boats, part number 218710. May be used on other boats. Part Number: 218710. Boat Manufacturer: Rinker Boats. This pinstripe is constructed out of black and silver colored marine grade vinyl with an adhesive backing. Boat part number 1003039 is a NEW, out of the box, pinstripe tape from Stingray, part number unavailable. Boat Manufacturer: Stingray. We're your port for thousands of hard to find boat parts, original manufacturer's parts and marine surplus. Boat part number 1072073 is a new roll of pinstripe tape from Misty Harbor, part number 1617. Manufactured by Keg Graphics, part number unavailable;. Part Number: 1617. This pinstripe tape is constructed of vinyl. The roll is roughly 3-3/8" x 150' feet. Colors are: navy blue (1/8"), white (1/4"), navy blue (1/16"), teal green (1/4"), navy blue (1/8"), clear (1-3/4"), navy blue (1/8"), white (1/2") and navy blue (1/8"). Colors are black (3/4"), clear (3-3/16") and dark royal blue (1"). (JW/ LOC: 96 C / 9059538). THIS TAPE WAS MADE BY SHARPLINE AND WAS USED ON FOUR WINNS BOATS. IT IS A VERY HIGH QUALITY PINSTRIPE.ITS PERFECT FOR REPAIRS OR UPDATING THAT OLDER BOAT, TRAILER, RV. AND MANY OTHER PROJECTS. Can be used on other boats. Part Number: 127837. Simply peel off and apply to any dry, clean surface. We're your port for thousands of hard to find boat parts, original manufacturer's parts and marine surplus. Boat part number 1078049 is a new pinstripe decal for Rinker boats, part number 218712. Part Number: 218712. Boat Manufacturer: Rinker Boats. Mount: Adhesive Simply peel off and apply to any dry, clean surface. Simply remove the adhesive backing and apply to any clean, dry surface. Boat part number 1070567 is a new roll of red glitter decal striping. Commonly used on Ranger Boats, part number unavailable. It is roughly 120' x 3 1/8". Canceled Orders and Order Changes . There are (3) colors blue / tan / taupe, as shown in the pictures. This is slightly dirty from storage. (SH / LOC: 74 A / 9051789) (7). Part Number: 161734. We're your port for thousands of hard to find boat parts, original manufacturer's parts and marine surplus. Check out this deal! Material: Marine Grade Vinyl. Color: Red. Boat part number 8502634 is a new roll of pinstripe tape from Sea Ray Boats, part number 1977201. Part manufacturer and number unavailable. May be used on other boats. Part Number: 1977201. This pinstripe is constructed out of white and navy blue colored marine grade vinyl with an adhesive backing. Simply peel off and apply to any clean, dry surface. Sold as seen in pictures. We're your port for thousands of hard to find boat parts, original manufacturer's parts and marine surplus. Check out this deal! There are (3) colors green / tan / taupe, as shown in the pictures. (SH / LOC: 71 B / 9051784) (3). Boat part number 1005113 is a new pinstripe tape roll from Rinker boats, part number unavailable. Manufacturer: Rinker. Just peel and stick any to any clean DRY surface. Colors: Silver / black / white / mauve. Boat part number 8600666 is a NEW, out of the box, boat pinstripe from Wellcraft Marine, part number 1995601. Commonly used on Larson boat models, part number 05727261. May also be used on others. Part Number: 1995601. Boat part number 1014107 is a NEW, out of the box, roll of 1 1/4" H x 150 FT red and gold colored vinyl boat pinstripe from Bayliner Boats, part number unknown. Boat Mfg: Bayliner Boats. We're your port for thousands of hard to find boat parts, original manufacturer's parts and marine surplus. Part Number: 145442. Features (1) 1/4" red stripe and (1) 1/4" bronze stripe, with 3/8" of spacing between them. Simply peel off and apply to any dry, clean surface. We're your port for thousands of hard to find boat parts, original manufacturer's parts and marine surplus. It is roughly 7 5/16" x 80' feet. It has a gold stripe 1/2", blank space little over 1/2", gold stripe 1/2", blank space 1/2", black stripe 1/2", blank space 1/2", red stripe 1 7/8", blank space 1/2", and the brown which is more of a purple brown 2". Boat part number 1021416 is a NEW 150 ft x 1/2" roll of US Marine Bayliner pinstripe / deck stripe, mfg. part # 1807991. We're your port for thousands of hard to find boat parts, original manufacturer's parts and marine surplus. Boat part number 8701544 is a new roll of pinstripe decal tape for a 2017, Escape model Marquis Yacht, part number 8154114, may be used on other boats. Part manufactured by Sharpline, part number 156974-01. Boat part number 1021106 is a new 150ft x 1 5/8" roll of pinstrip decal. maybe used on other boats. We're your port for thousands of hard to find boat parts, original manufacturer's parts and marine surplus. This hull pinstripe is constructed out of polo green and white colored marine grade vinyl with an adhesive backing. Boat part number 8602377 is a new roll of pinstripe tape from Larson Boats, part number 01479-03. Marine Boat Pin Stripe Mulit-Colors !!!!!!!!!!!!!!!!!!!!!!!!!!!! !